The Romance Dish: No Maybes About It! I really need to stop raiding Desire Author Rachel Bailey's bookcases! She introduced me to the wonderful Three Sisters Island trilogy that formed the subject of last month's Second Helping Review. And now she's given me MAYBE THIS TIME by the fabulous Jennifer Crusie. I've always had a fondness for ghost stories. If you looked at my bookcase, among all the luscious romances, you'd find a lot of books with titles like CREEPY LONDON GHOST STORIES, THE WORLD'S GREATEST GHOST STORIES, and THE MAMMOTH BOOK OF GHOST ROMANCE. Hmm, ghosts and romance! Now, you're talking! I've got such a fondness for ghost stories that I recently wrote one (THESE HAUNTED HEARTS). So that's putting my money where my mouth is! Andie (Andromeda) Miller is the type of heroine who I think Jenny Crusie does better than pretty much anyone else. She's intelligent, she's strong, she's made the hard choices and she lives with the consequences without whining, and she's got a bodaciously smart mouth. The snarky heroine! A JC specialty! I like snark when it's not spiteful, and Andie is such fun to spend time with. She greets personal adversity, danger and the supernatural with many a one-liner and because she's brave and funny, you're on her side from the start. She's also got her heart in the right place as well as her head. I was completely charmed! Pun intended. This story is a modern take on Henry James's famous novella THE TURN OF THE SCREW. I read this in first year uni and haven't read it since, so I have to say my recollection on the details is fairly shaky. But from memory, a young governess goes to an isolated house in England where she discovers two seriously creepy children under the influence of even creepier forces. I'm pretty sure it does not end well! For me, MAYBE THIS TIME also had elements of JANE EYRE. Governess in creepy circumstances? Yup. And things end up better in MAYBE THIS TIME than they do in THE TURN OF THE SCREW, you'll be pleased to hear. Again, JE rather than TTOTS. Ten years after her divorce from gorgeous lawyer North Archer, Andie agrees to help with two children to whom North acts as guardian. The children live in a creepy castle in the wilds of Ohio (makes sense in context) and so far any attempts to settle them with a governess have failed. Shades of THE SOUND OF MUSIC. North wants to get the kids to the city where they can lead a normal life including school, but every time anyone tries to remove the children from the castle, awful things happen, including death. He has the feeling that Andie's brand of practical common sense might be just the solution to his problem and he bribes her into accepting the job. So our intrepid heroine, who has finally decided to move on from her youthful passion for North by getting engaged to writer Will Spenser, ventures into the haunted house. There are lots of fun scenes as she wins over the kids - I like those scenes in THE SOUND OF MUSIC too! There are some suitably creepy old retainers. Can't have a ghost story without a sinister housekeeper or two. And there are plenty of scary moments where the ghosts in the house flex their muscles against the positive force that is Andie. One of the joys of a Jenny Crusie book is the plotting. She has this wonderful ability to build and build and build and then combine everything together into fireworks at the end. MAYBE THIS TIME is no exception. There are lots of characters and it's a joy watching them interact to the purpose of comic chaos. In a JC book, there's always at least one great comic setpiece. It starts out quietly but the crescendo goes on and on, with more and more characters getting involved, until everything comes to an uproarious ending. The comic setpiece in this one shows Andie ending up as host over a single evening to psychics, TV reporters, Andie's fiance, ghosts, and the man she's never forgotten. I always catch my breath in awe at the beautiful construction of these scenes. Juggling a crowd of people is a pain when you're writing! And Crusie makes it all look so effortless. There's certainly an element of slapstick but it's really clever slapstick. Love it. I haven't talked much about the hero of this one. Partly because for much of the book, while North is present in spirit (if not quite in the same way as the ghosts! ), he's not on the page. He's again a familiar figure from Crusie's output - the gorgeous frat boy who hides hidden complexity and finds himself drawn to the dark side in the form of the snarky heroine. It's pretty clear from the start that he still loves Andie and it's pretty clear that she still loves him. The end of the journey is never in doubt, but the journey is huge fun, with a few scary moments along the way. Comedy and suspense are a difficult mix to bring off right but MAYBE THIS TIME succeeds in spades! Are you a Jenny Crusie fan? Do you have a favorite? Do you like a touch of paranormal with your romances outside the full-scale paranormal genre? Do you like a smart-mouthed heroine? I read this one a while back and also enjoyed it a lot. My favorite heroines happen to be snarky and independent too. So this was right up my alley. I love all things paranormal but find ghosts or psychics are favorites and under utilized amongst the rows of vampires and werewolves out there. Great review! Christina, I must say I'm very partial to a good ghost story, whether romantic or scary. This one was GREAT!!! So glad you're another fan and that you enjoyed my thoughts! PJ, I'm here, I'm HERE!!! As some of you know, my hot water system decided to die when I had guests over the weekend and then I was fielding tradesmen all day yesterday and tripping over bits of equipment. It passed me by that it was my day for a Romance Dish review! I have this one on my tbr. Not so much into paranormal, but do like a smartmouthed heroine sometimes. If you like smart-mouthed heroines, Crusie is your author! Pat, give it a go! I think you'll enjoy the story even with the paranormal elements. And the humor is fantastic. Yes I've read several of her books. Favorite GETTING RID OF BRADLEY. I'm not a huge fan of ghosts but I still read them. I do like a take charge woman who talks back! GETTING RID OF BRADLEY is a good one. Laurie, Getting Rid of Bradley is one of her best, I think. There's a wonderful scene when everybody's talking about Bradley but they're all at cross purposes because they're talking about DIFFERENT Bradleys. You made me want to reread Maybe This Time, Anna. 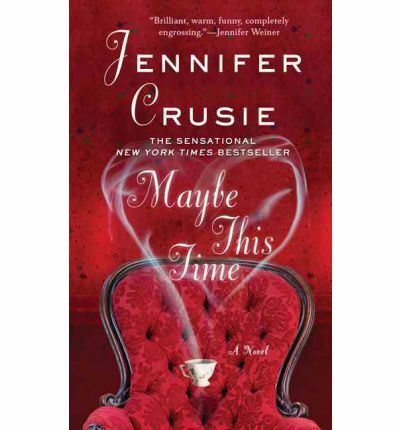 I think I've read--and reread-- nearly everything Jenny Crusie has put her name on, including all her collaborations, her essays, and her blog posts. I'm not a huge fan of most paranormals, but I do like ghosts (if they are not too scary) and angels (if they are more Debbie Macomber than Nalini Singh). I think Bet Me is about as close to perfect as contemporary romance gets, but Welcome to Temptation is my favorite Crusie because I'm in love with Phin. And Manhunting will always be special because it was my first Crusie book. Our first Crusie book is always special, isn't it, Janga? Mine was Welcome to Temptation too. Janga, we really are reading sisters! I love WELCOME TO TEMPTATION too - Phin's just gorgeous. And I agree with you about Bet Me. Something I love about it is that it's purely a romance! I'm not really into horror stuff but I like ghosts and angels too. As I said when I sent in my story for that Mammoth anthology of ghost romance, I'm more Ghost and Mrs. Muir than Night of the Living Dead! Oh, don't talk to me about Night of the Living Dead! I saw that movie at a drive-in when I was in high school and it traumatized me for years! lol! Heck yes, I'm a JC fan! I'm not huge on ghostly books, but I did very much enjoy the hero and heroine dynamic in this book. My favorite JC book? Probably MANHUNTING...I still picture that scene vividly where she's playing golf and makes that guy have a heart attack...and her and the hero in the boat together. "If I knew you were going to be this active, I wouldn't have invited you along." Hilarious stuff. Thanks to you, I've now read the Three Sisters trilogy and enjoyed it mightily! Thanks!! Glad you enjoyed the Three Sisters trilogy, Hellion! Hey, Hellion, brilliant news on the Three Sisters Trilogy. Isn't it great? Especially that second book with the nerd hero. Thanks for picking up the recommendation. I have to re-read Manhunting. It was my first Crusie and I have to say I hardly remember it at all. Must dig it out! I also love the one (think it's Anyone but You) with that wonderful lugubrious dog that's mostly basset who keeps getting stuck halfway over a window sill and the younger hero/older heroine dynamic. Oh, Catslady, you have some fun reading ahead of you! Catslady, you're a lucky duck, having the discovery of the brilliance that is Crusie ahead of you. I still think my fave is WELCOME TO TEMPTATION, but they're all good. BET ME is a fave too. I have read a few of her books and really enjoyed them. I haven't read this one though. I like a little paranormal but now a lot. Oh, so sorry! Last month I was AWOL but I was at a writing retreat and had no internet access. This month, I was dealing with a broken hot water system and missed swinging by here when it came up! I'm here now - thank you to everyone who swung by both this month and last. And thanks to PJ and Andrea for holding the fort for me! Oh, phew! With all the travel this last month, I'm a bit at sea with dates at the moment! Love Jennifer Crusie! And Manhunting and Bet Me are fab!!! Oh I may have to go back and re=read them now! *shakes her fist...No I can't do that. i'm a sucker for gothic romance an a contemporary one sounds grand!! I really have to re-read Manhunting! And it's ages since I read Bet Me too. Clearly I need to go on a Crusie reading jag. When I read Maybe This Time, it reminded me that she writes like absolutely nobody else. LOVE her snarky voice. Hi Nancy! You're talking my language. I cut my romance reading teeth on Victoria Holt so, of course, I ♥ me some good gothic romance! My pleasure, Janice! Lovely to meet another Crusie fan. Definitely give Maybe This Time a go. I suspect you'll love it! I love this book! I was one of the fortunate few who won an early MS copy before the book was released. Might be the best thing I've ever won. For me, BET ME is the perfect romance novel, with WELCOME TO TEMPTATION pulling a close 2nd. I don't mind this sort of para element. A bit of magic or afterlife stuff. That's about my para limit. (Hi Terri!) I have these on my shelf, too. I bought a lot of books when Borders went out of business & have a pile of Jennifer Crusie books. Terri, so glad you love this book too. I'm not quite sure how I ended up missing out on it at the time - thank goodness for friends who lend you books, huh? I am not a paranormal fan, but I read this book & really liked it. I also read Trust Me On This, which is more of a humorous romantic suspense & that was really good, too! Sharlene, I need to check out Trust Me On This! Do you know if it was previously published under another title? I looked up the Amazon page and the blurb rang a bell. Love your review, Anna! Like most of the other commenters, I've read everything Jenny Crusie has written and this is one of my favourites. Though I have a really soft spot for Faking It and Bet Me. Rachel, thanks so much for lending me this book! I just loved it! I am a Jennifer Crusie AND Anna Campbell fan, so no question this book is for me! Tina, aren't you a sweetie? On behalf of both JC and Anna Campbell, I thank you! Seriously, this book is great fun!